The need for accurate chemical trace analysis is vital to resolving industry problems, when swift, definitive results are essential to addressing a question regarding a product’s purity or related to a manufacturing issue. Quite often, the species of interest will be present in trace or ultra-trace levels which can give rise to analytical challenges, especially when it involves complex sample types. Unexpected stains, discolorations, deposits and evidence of corrosion all constitute trace residues. Understanding the chemical nature of these residues and their source will require robust analytical studies conducted by experts, who can deliver the insight you need in order to make informed decisions. Our chemical trace analysis services deliver credible results and are conducted by experts who have experience in trace analysis across many industries, employing highly sensitive instrumentation and specific analytical methods which are capable of analysis to very low levels of detection, including in the parts per million (ppm), parts per billion (ppb) and parts per trillion (ppt) ranges although this can be sample-dependent. 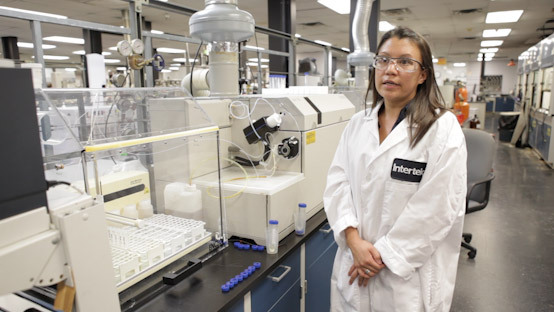 Intertek laboratories detect, identify and measure trace amounts of chemicals in products and materials down to low-trace and ultra-trace levels. Chemical residue analysis studies include the identification of unknown substances, diagnosing and resolving contamination incidents and troubleshooting to rapidly solve problems. We deploy a wide range of identification techniques for residue trace analysis that includes mass spectrometry, chromatography, spectroscopy and other advanced instrumentation.